Want a nostalgic tour of Door County? Want to take advantage of special tours, like theater and dinner packages, and not have to worry about driving yourself all around? Call to make your reservations today! And be sure to tell them that DoorCountyNavigator sent you! Book it now! 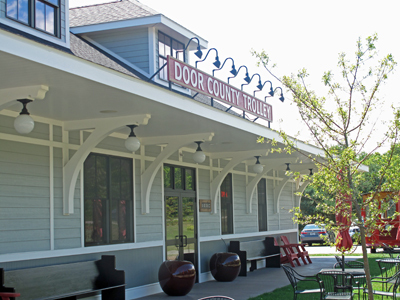 The Door County Trolley station is Door County's Souvenir Destination with an extensive Gift Shop, full Coffee and Espresso Bar, and outdoor Trolley Bar featuring wine, beer and specialty drinks. 8030 Hwy 42, Egg Harbor. Want to see some parts of Door County you may not have seen yet, like some of its wonderful lighthouses, and get a narrated tour? Well A.J. Frank and Door County Trolley have your ticket – literally! 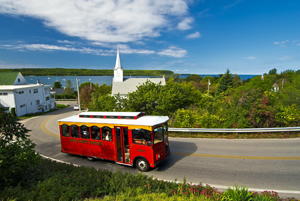 Door County Trolley can help you with a lot of creative tours and packages to make your Door County vacation memorable. Step aboard an old time trolley and see the scenic beauty of the peninsula and learn some of its history. You may even get some good advice on where to dine and relax. Lighthouse tours, Spring Blossom Tours, Scenic Tours, Bloody Mary and Brunch tours and more. Their Door County Trolley Station, just north of downtown Egg Harbor, is spectacular! 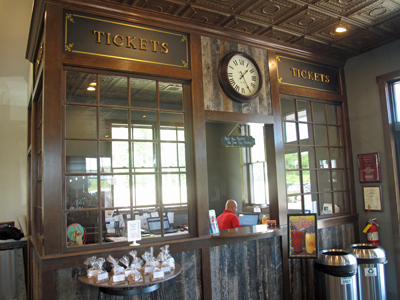 Outdoor seating, an indoor gift shop and ticket station, real train station waiting room seats, drinks you can take aboard the trolley and a lot more. Thiis is a first-rate experience all the way. Aboard the Murder & Mayhem Tour, you will weave through and retrace the steps of the Peninsula’s most wanted criminals, past and present. Tour goers will be told the facts of the core stories of the suspects, clues and alibis, as to relive the scenes of the 6 crimes showcased. Trolley guests will have a Supper Club experience pre-prohibition era, with stops for a Classic Wisconsin “Old Fashioned” or “Manhattan,” dinner with an American Supper Club Cuisine and top it off with music entertainment. A Sunday morning eye opener! Trolley guests will enjoy three unique stops for those popular Sunday morning cocktails, Bloody Mary’s & Mimosa’s. This tour also includes a traditional Sunday brunch at the Log Den Restaurant. Guests are navigated atop 225 foot limestone bluffs overlooking the islands. Travel back roads only locals know while learning about Door County history and the best places to wine, dine & relax. Trolley guests will receive VIP treatment with Private Tastings at 4 local wineries topped off with a fabulous lunch. Trolley guests will enjoy guided tours at these majestic landmarks, tucked away in the Peninsula’s hidden bays and coves. Lunch option is available. Experience 2 Door County wineries, distillery, & micro brewery with Private Tastings at each of the three stops. A fabulous lunch is included as well. Step aboard the "Trolley of the Doomed!" as we share tales of ghostly sunken ships, haunted lighthouses and mysterious happenings on the darker side of this spirited peninsula. Guests will visit 4 haunted pubs and taverns and enjoy intoxicating tales at each stop. We will spend 30-40 minutes at each stop. This 30 minute trolley ride is perfect for young families with their children. This shortened trolley ride allows the wonderful trolley experience, without the full length of the adult based Trolley Tours. Children may partake in an “I Spy” adventure game while on the trolley. Aboard the Winter Wonderland Tour, trolley guests will taste at two Door County award winning Wineries, followed by a cozy sleigh ride through “The Doors” most wintry landscapes. Top it off with a fireside lunch at the romantic English Inn. Spring Blossom Tour Aboard the Spring Blossom Tour, trolley guests will partake in Private tastings at two award winning Door County Wineries. Followed by a cozy carriage ride in the quaint village of Fish Creek. Trolley navigates guests to the hidden peninsula blossoms and majestic scenic overlooks, that this rejuvenated season brings. Top it off with a fabulous lunch at the English Inn. 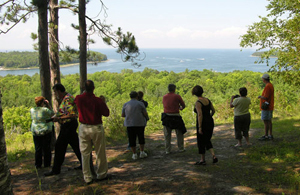 DoorCountyNavigator recommends you get advanced purchased tickets as tours sell out regularly. So book now! Book the Trolley for a Private Event! Yes! 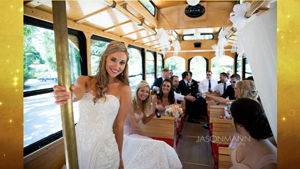 The trolley is also available for weddings, family reunions, business groups, birthday parties, parades and festivals! Would that be so cool for your next private event?! 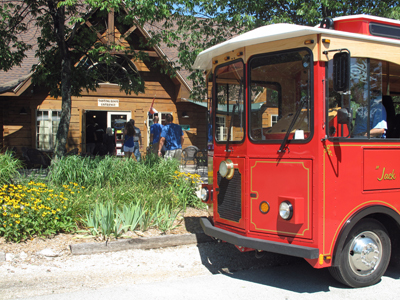 Door County Trolley is a good connection to lots of good things on the peninsula! Give them a call for packages, prices and other information – and by all means, take this trolley right to their website! And please tell them that DoorCountyNavigator.com sent you! - that helps keep this site alive & well . . . for you!